It's not often that you see an insect that so beautifully compliments the plant it has alighted on. Sure, you could say this insect has evolved camouflage specific to this plant that is a critical part of its life cycle. But with these bold colors, I think this goes beyond camouflage. 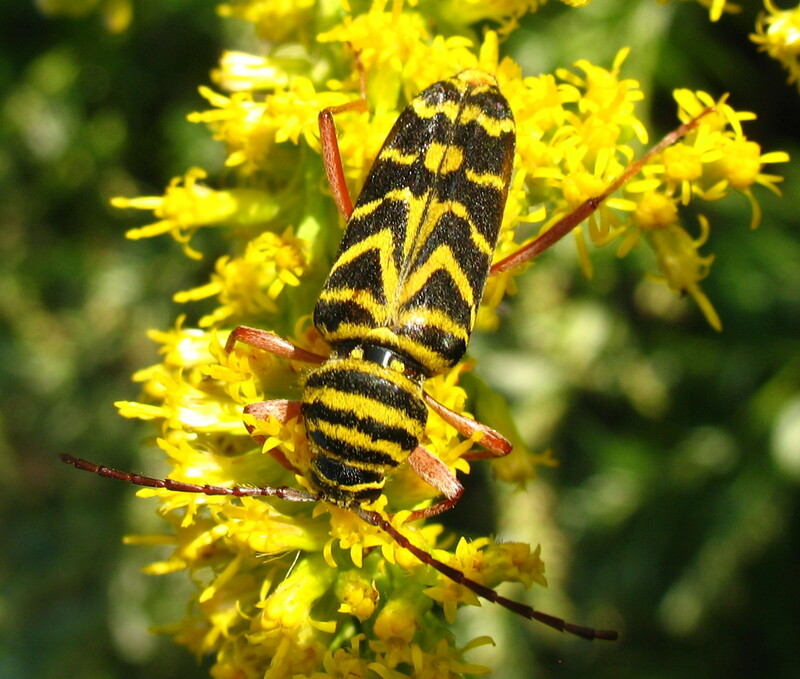 This is a Locust Borer, which gets its name because its larvae bore into Black Locust trees. A large infestation of Locust Borer larvae can kill a tree. Adults feed on pollen, commonly from Goldenrod like in this photo. Hence the yellow color of the insect. I took this photo in Amico Island Park in Delran, NJ. Here is another from that day. 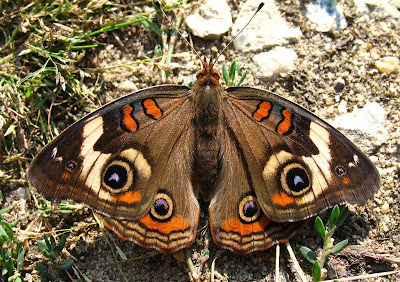 This is a Common Buckeye. Using the opposite of camouflage, the Buckeye's colors make it stand out rather than blend in. The idea is to stand out so much that it scares away predators, who think those spots are the eyes of some much larger creature. Amico Island Park is located where the Rancocas River empties into the Delaware River, across from Philadelphia. If you turn around, you see the city skyline and the Tacony-Palmyra bridge across the Delaware (but then you turn your back on this beautiful wildlife!). At one point, this huge ship turned in from the Delaware and up the Rancocas. Its name is Karaweik, and it is bulk carrier owned by a Japanese shipping company. That little white triangle to the right is a sailboat, out for a leisurely Sunday jaunt when it came across this behemoth. This ship really gets around - I found photos of it on the web in Japan, Washington State, Panama and Greece. Just 3 days ago it passed westbound through the Panama Canal and is now somewhere in the Pacific Ocean. Wow that's the ship we saw on the river, we evidently saw the same ship day this photo was taken. I also have this photo, some where in my collection of photos. I was amazed to see such a large vessel on the Delaware/Rancocas creek, My husband said its possible the Delaware is quite deep. Guess so! I believe the shipping lane is almost 40' deep in the Delaware. Deciding on the best chanel replica sale with regard to males is definitely a challenging choice. Actually, actually males are receiving a challenging period deciding on the best option with regard to on their own. This is actually the info that you should find a very good hublot replica with regard to males. Big event the actual view that you purchase may match a person completely so that you will may feel relaxed. Attempt to purchase the view which suits your financial budget. There are plenty associated with points you'll want to keep in mind therefore that you'll be capable to find the greatest view that you could perhaps possess. There are plenty associated with gucci replica you need to think about for you personally every single child purchase the greatest 1. Males wrist watches can be found in wide range associated with styles and designs. Due to these types of options, you actually may choose the right match simply for everybody. In the event that you are searching for a perfect present for any interpersonal individual, a wristwatch might be among the best craps bets. Providing a variety of is actually 1 great rolex replica to exhibit understanding. A wristwatch that is the size of it's status. When you are putting on 1 the actual large hermes replica face as well as special problems show design as well as variation. To hear watch without the word smart in front of suisse replique montres it will soon be indicative of a heirloom description. Even luxury watch brands have embraced smartwatches with some exciting announcements having already been made this year.We've seen Apple finally take the plunge into the smartwatch market, Pebble hit us with not one but three new smartwatches in this year alone, and LG has dived even further into the pool with yet another smarter offering. So what else do we have to look forward to? Well, there are still three months left of 2015 and plenty of devices left to keep an eye out for.It seems 2015 has been, and will continue to be, the year of intelligent wrist adornment, so here are all the best smartwatches to look forward to before the end of it. We have included devices that have been announced but are not yet available to buy, as well as a few rumoured timepieces for good measure.LG has announced the second generation of replica breitling its Watch Urbane which offers a full range of wireless connections, including 4G and 3G meaning it will be able to make and receive calls, operating independently of your connected smartphone.The LG Watch Urbane 2 expands the P-OLED display to 1.38-inches, 348ppi, and is powered by the standard Qualcomm Snapdragon 400 chipset, with 768MB RAM. There's 4GB of internal storage, should you wish to keep your music offline, and GPS for tracking your runs and so on.The LG Watch Urbane second edition will be compatible with Android and iOS devices and it will be available in Space Black, Opal Blue, Luxe White and Signature Brown, which refers to the strap colour options. The new LG Watch Urbane 2 will be showcased in NYC on 1 October but no pricing has been revealed as yet.More recently, Biver told CNBC that he was pleased the Apple Watch arrived as it showed you could charge a replique montres high price for smart connected watches. He added that the smartwatch market is ready for "real watches" following Watch.